The Annual Student Archaeology conferences is the first ever opportunity for undergraduate and postgraduate students in disciplines as diverse as archaeology, history, history of art, anthropology and the natural sciences to come together and share their research in order to discuss various academic perspectives on the past. The ASA conferences take place each June, are run by students and last for two days. Students from universities across the UK are encouraged to participate either by presenting a paper, preparing a poster or helping with the organisation of the event. Each ASA conference aims to be an event, not only to allow students to share and discuss research and ideas, but also to enable networking and an enjoyable social time spent with like-minded people. 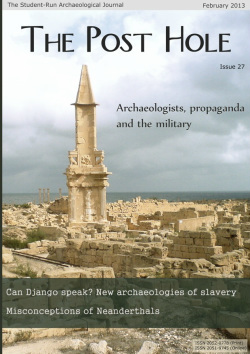 The ASA conferences work in close partnership with the UK's only undergraduate-run archaeology journal, The Post Hole, which publishes selected papers from the conference, thereby increasing the impact of student research and thinking in academia to an even greater extent.